Today we shine a light on FIVARS 2016 selection “Invisible” – an extraordinary short film by director Lilian Mehrel created for immersive 360 video playback technology that is full of heart and nuance. Invisible is a short virtual reality film that takes a 360º look at what it means to feel invisible – or seen – through a minimalist live-action narrative. Our story begins and ends at the Metropolitan Museum of Art, introducing us to three characters with varying experiences of being acknowledged. We hear their thoughts as we flow from a museum guard – whose job is to be invisible – bantering with a nearby sculpture, to an artist and new mother of twins recalling the first time they looked at her, to a lonely trans girl perceived mistakenly by all but a blind woman. The film is inspired by Lana Wachowski, and the story she revealed at the HRC Visibility Awards. This trans woman we know as the cinematic visionary behind The Matrix was almost lost to the world once. Struggling with how the world saw – or didn’t see – her, she wanted to disappear. She went to a typically-empty train platform to jump. On that day, someone happened to be there. And because that stranger looked her in the eye, and didn’t look away – she is still here. We are also inspired by eye contact as a striking affordance of virtual reality. When a character in 360º video looks at the camera, it feels as though they are looking directly at the viewer. This virtual eye-contact affects viewers unexpectedly. Our viewer is free to explore with their gaze, as they swivel in the headset; they may choose to peer deeper into the character’s eyes, or to look away in curiosity. They may choose to feel invisible, or seen. Sometimes the viewer is caught between two characters gazing at each other. As the viewer engages the film with their choices, they will discover deepening dimensions of the story. With this early foray into narrative virtual reality, the viewer is able to affect what they see in the space, but not what happens – akin to the act of recalling emotional experiences. Emotional reality is our guiding light; we aim to blend the cinematic and life experience, where virtual reality may thrive. We are also playing with the mundane and the profound, balancing tones of humor and gravity in our virtual reality, as in life. How can VR give people dimension? We’d love to inspire viewers to take a look. Lilian Mehrel creates film & TV, illustrated books, and virtual reality. She is a writer/director with a fresh sense of humor and vision. She is interested in surprise moments of human connection – hoping to inspire viewers to look for such moments in life. Her films have premiered at the Tribeca Film Festival and won her awards including ABC/Disney, the Marcie Bloom Fellowship, Alfred P. Sloan, the Science & Entertainment Exchange, and the Nancy Malone Directing Award. With a PD Soros Fellowship for New Americans, she is an MFA candidate at New York University’s Tisch Graduate Film in Directing & Writing. Lilian was born to a Kurdish-Iranian mother and German-Jewish father, sparking her life-long experience of multiple worlds. From Miami public school, she went to Dartmouth College, where she was awarded a Senior Fellowship. She wrote and illustrated a 226-page family memoir. Her stories reveal the underlying universalities she sees between people, shaped by her work connecting youth from conflicting countries. Lilian’s work includes creating a James Franco behind-the-scenes series, videos for Vogue, and a collaboration with Within’s virtual reality films and the Portals project at the United Nations, as the Shared Studios Storyteller. 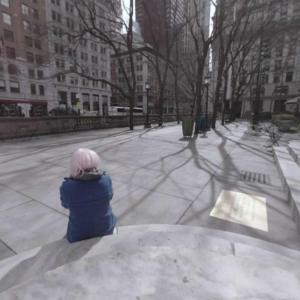 She created one of the first virtual reality narratives – haunt – which played at Tribeca’s Interactive Playground.